Swimming holes are what Southeastern summers are all about. And while the Chattanooga area is home to some seriously incredible places to take a natural dip, it&apos;s also home to plenty of private land with a number of tricky access issues. So, disclaimer: It&apos;s likely that your favorite Chattanooga swimming hole won&apos;t appear on this list. That said, even though some of the swimming holes mentioned below require a bit more drive time than others, they&apos;re all totally worth the effort in the end—especially on hot and humid summer days. 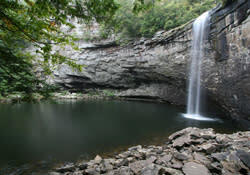 So, without further ado, here&apos;s a sampling of some of our favorite places in the Chattanooga area to (legally) cool off if you prefer your swimming pools to be of the natural persuasion. First, an obvious one: North Chick Blue Hole. Just 20 minutes from downtown Chattanooga in nearby Soddy Daisy, North Chickamauga Creek comes tumbling down the side of Walden&apos;s Ridge, carving out a steep gorge between Signal and Mowbray mountains, and creating a series of deep, welcoming pools along the way. The creek is littered with boulders that foster a number of different little pockets of swimming holes, so hike up the creek until you find the perfect spot. Like any great swimming hole, there are rocks to jump from—or for the less adventurous, to sunbathe on. Note: this spot has become quite popular over recent years. As such, there have been disrespectful visitors to the area who leave trash behind. Do not be one of them! And better yet, if you make a visit to this swimming hole, we recommend bringing along a plastic trash bag to see how much you can collect. Well known by climbers as one of the area’s choice sport-climbing crags, Deep Creek also has more leisurely activities to offer visitors. The creek is accented by numerous swimming holes just waiting for you to find. Enjoy a languid afternoon of lounging, and maybe some climbers will be there to give you a show. 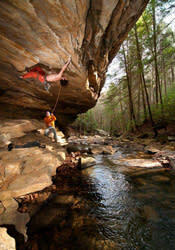 Of note: The acquisition story of Deep Creek as a major recreational spot may be familiar to climbers. The land the cliff line rests on is owned by the Tennessee Department of Environment and Conservation and is part of the Cumberland Trail. After much negotiating and peace offerings brought on the part of the SCC, climbers were officially granted access to the land in 2010, and the SCC built a sizable parking area to accommodate visitors. Detailed directions to Deep Creek as well as the gate access code may be found on the SCC&apos;s website along with postings that urge visitors to be respectful of neighboring private property and the delicate environment of the creek. Located about 40 minutes from downtown Chattanooga, Foster Falls is one of the most breathtaking waterfalls in the state of Tennessee. 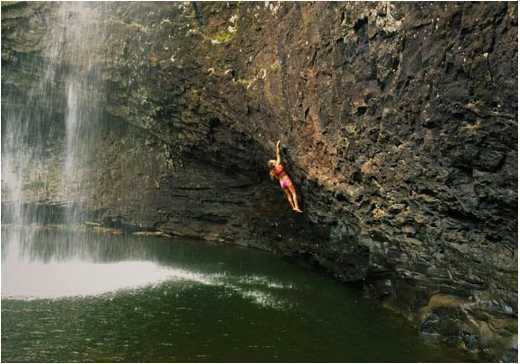 And for swimming hole enthusiasts, the deep plunge pool at the base of the 60-foot drop is about as good as it gets. A short hike combining the climber’s loop trail with the Fiery Gizzard Trail atop the cliffs is a great way to work up a sweat before taking a summer dip. And while this place can get pretty crowded during the summer months, it&apos;s popular for a reason. Seriously awesome spot! Disclaimer: You cannot, we repeat, CANNOT swim in Lula Lake itself. But farther down the trail from the turquoise waters of the lake, Rock Creek spills over the side of a precipitous cliff, creating the gorgeous 110-foot Lula Falls. Lula Falls lacks the deep plunge pool found at some of the other large waterfalls in the area, instead smashing down onto large boulders and flat bedrock. So, we wouldn&apos;t exactly call it "swimming" per se, but a nice summertime staple is standing below the falls, sliding on your behind on the slick rocks below, and letting the water smack down on your head and shoulders with cold, refreshing, erratic claps. Obviously, be smart about it. If the falls are flowing at an especially powerful rate, it&apos;s probably not wise to stand underneath them. But during the dry summer months, you normally shouldn&apos;t have anything to worry about. The Lula Lake Land Trust opens its gates on the first and last weekends of each month. Yes, we&apos;re including another waterfall plunge pool. They&apos;re just too good not to mention! 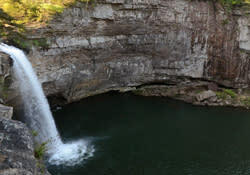 This one, in particular, DeSoto Falls, is located about 45 minutes from downtown Chattanooga on the western brow of Lookout Mountain in Mentone, Alabama. The upper reaches of this waterfall are characterized by a series of smaller cascades just below a man-made dam. Then, in a rather dramatic unfolding of events, the cascades drop off a steep precipice creating the 104-foot DeSoto Falls, which loudly crashes into the giant punchbowl beneath. It&apos;s within this punchbowl that weekend warrior swimmers can take a cool summertime dip. To get to the bottom of the falls requires some rugged scrambling down a very steep trail, but reaching the beach and cool waters below is a just reward.